Travelling through Europe and visiting sites heavily impacted by the two World Wars makes Remembrance Day feel particularly poignant this year. Grave markers at the Adegem Canadian War Cemetery in Belgium. From cobblestone memorials for Holocaust victims in Berlin to photographs of bomb-devastated German cities at the German National Museum of Contemporary History (Haus der Geschichte) in Bonn; from the massive Canadian Memorial in Vimy to the many roadside memorials in rural France and Belgium, this past year has allowed me to experience war in a highly impactful way. My first experience with a war cemetery was last January while driving from Antwerp to Bruges. 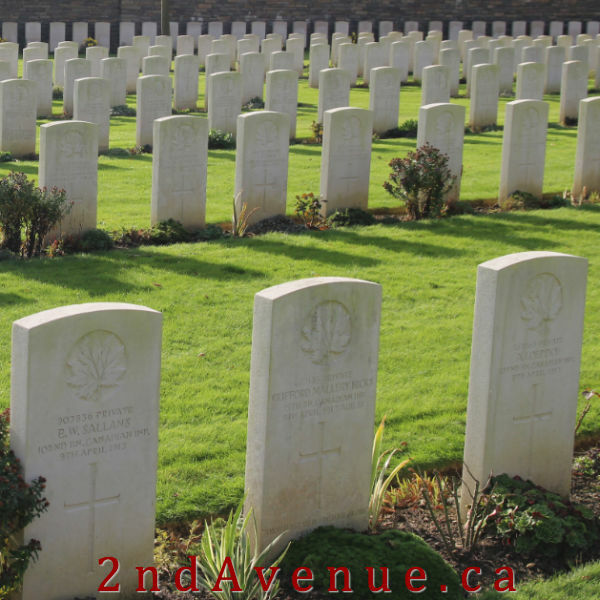 We had taken a minor highway and stumbled across the Adegem Canadian War Cemetery. I was unprepared for the emotions that came up while walking along the rows of grave markers. My heart swelled with pride, my stomach clenched with horror, my throat choked with the sense of loss, and my eyes welled with tears. I thought of all the people who fought against fascism and Nazism. All the people that didn’t make it home to their families. All the people injured and traumatized. All the grave markers without names. All the freedoms granted to subsequent generations. We came across many war memorials during the three weeks we spent in a camper travelling across France. Every memorial, marker, and cemetery brought on that same convoluted gut-punch, choked-up sadness tinged with appreciation. 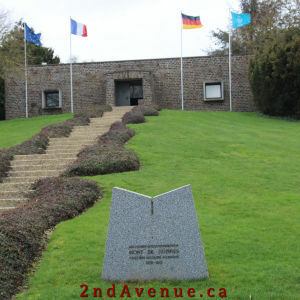 Entrance to the German cemetery at Mont-de-Huisnes. And it wasn’t just the Canadian memorials that were emotional. We stopped at a war cemetery in Normandy (Mont-de-Huisnes) that houses almost 12,000 German dead – from both the First and Second World Wars. I didn’t feel the sense of pride that Canadian or Commonwealth memorials bring on, but the feeling of loss and futility was certainly there. So many dead. So many families broken. So many loved ones lost. So many stories untold. War cemeteries are light on context. There might be a plaque explaining the battle or operations that precipitated needing such mournful grounds, but generally the tombstones are left to speak for themselves. Memories of high school humanities and Wikipedia searches filled in some of the details for us, but often emotion took precedence over history. Visiting the Juno Beach Centre, at the site of the Canadian D-Day landing in Normandy, and the privately funded Canada War Museum (which also had a Polish contingent) near Adegem provided some necessary background. As did the small info centre at the Vimy Ridge Memorial. Sadly, there was no such context for our stop in Dieppe as the 19th August 1942 Memorial Museum is open very limited hours in the winter. On our trip to France last week, we specifically visited Dieppe to learn more about the predominantly Canadian raid on German-occupied territory that took place there on 19 August, 1942. Almost 60% of the over 6,000 men that went ashore in the Dieppe Raid were killed, injured, or taken prisoner. And the loses in the skies and at sea were calamitous as well. The magnitude of the operation was clear as marker after marker gave the same date of death – 19 August, 1942. 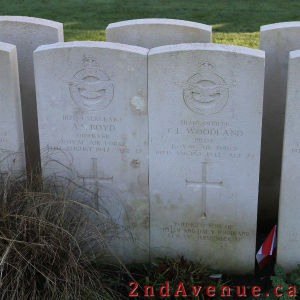 A few pairs of brothers were buried beside each other and there were a number of dual graves with Air Force members who must have gone down in the same place. Imagining the process of sorting out human remains and respectfully interring them brings up that stomach clench of reality again. How horrible must that have been. How awful to see your comrades fall. How tortuous to identify the dead. And how dreadful to convey the news to their families. After Dieppe, we stopped at Vimy – the site of a major Canadian battle in World War I, which has since come to symbolize Canada’s coming of age as a nation. 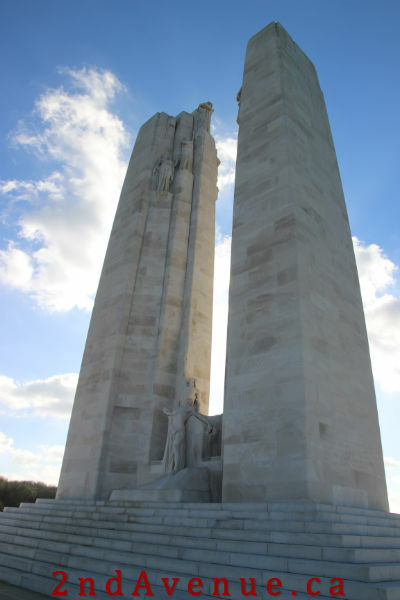 In addition to the giant limestone monument honouring Canadians who risked or gave their lives in the First World War, the Vimy Ridge site contains graveyards, smaller memorials, and preserved tunnels, trenches, and craters from frontline fighting. Seeing the proximity of the trenches and the deep craters from shells, bombs, and mines was a harrowing sight, but that distress was trumped when we reached the giant limestone monument erected in the mid-1930s (and pictured on the back of Canadian $20 bills). The lower walls of the monument are inscribed with the names of 11,285 Canadian soldiers killed in France whose final resting place was unknown. Thousands of unidentified bodies buried in nameless graves. Not being able to identify soldiers after their deaths (for whatever reason… all the scenarios I can imagine are simply awful) deeply troubled me. One of the cemeteries at Vimy has a plaque inscribed “Their Names Liveth Evermore.” But many of the tombstones have no names; they read “A Soldier of the Great War | Known Unto God.” Sometimes a regiment name as well, but often just a country – and occasionally not even that basic detail. Rows of grave markers at the Dieppe Cemetery. I was more upset leaving Vimy than after any previous war memorial or cemetery. The monument eloquently expresses the grief and sadness felt after the First World War, but yet the Second World War arose out of the reparations of what was presumed to be the only Great War. The sheer volume of tombstones inscribed with ‘Known Unto God’ clearly reflects the chaos and horror of war, but we are unable to stop repeating it. The scope of all the cemeteries, all the memorials, all the monuments shakes me. It’s one thing to hear the figures (more than 17 million civilian and military deaths in WWI and an astonishing 22-25 million military deaths and 38-55 million civilian deaths in WWII) and quite another to stand amongst the rows of gravestones commemorating the real human sacrifice. 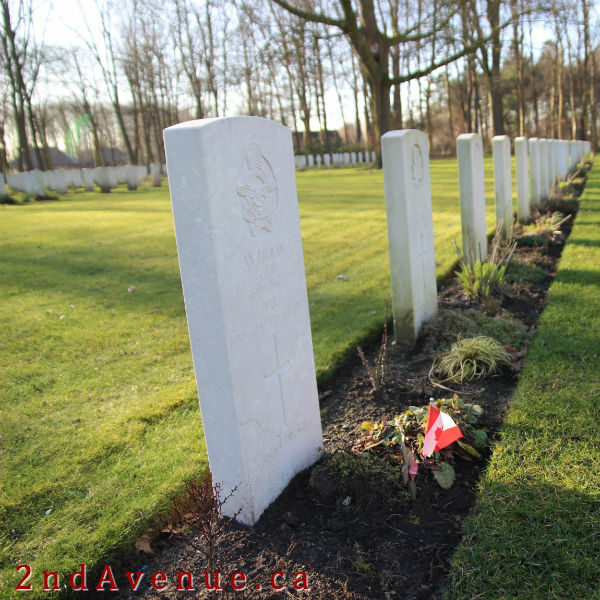 The white stones carved with maple leaves mark the final resting places of some of my countrymen – 61,000 Canadian soldiers killed in WWI and more than 42,000 in WWII. Part of the over 118,000 Canadians who have died while serving our country in uniform. Visiting war memorials, monuments, and cemeteries has really driven home the enormity and incredible loss of war for me. The quiet moments spent walking along the aisles of white stones are among the most profound I’ve experienced in the last year. Remembrance. Sorrow. Gratitude. Pride. And above all, the fervent hope that war will be no more. Laura – this was a privilege to read. You’ve very eloquently expressed your feelings; and all this stuff is so emotionally charged. It is all so needless, isn’t it? If nations could only have just met and talked their way through disagreements, all that loss would not have had to happen. Thank you for your caring article! Thanks for commenting, Janet. It’s been a privilege to visit the various memorials and cemeteries and I feel so lucky to be able to share my thoughts on those experiences. I don’t have anything much to add to this, as I feel like you’ve said it all, but I more just wanted to let you know this was beautiful and I am sure the thoughts of many! Laura, what a powerful insight. So many people do not know what devastation war leaves. I admire schools that present this, but it is so much more powerful when you actually see the devastation yourself. When we visited Dachau, Germany, we felt the inhumanity that man can bring to man. So senseless and useless.